Read or write single parameters in a CHEMCAD flowsheet. We provide the calls and the objects in a DLL file. 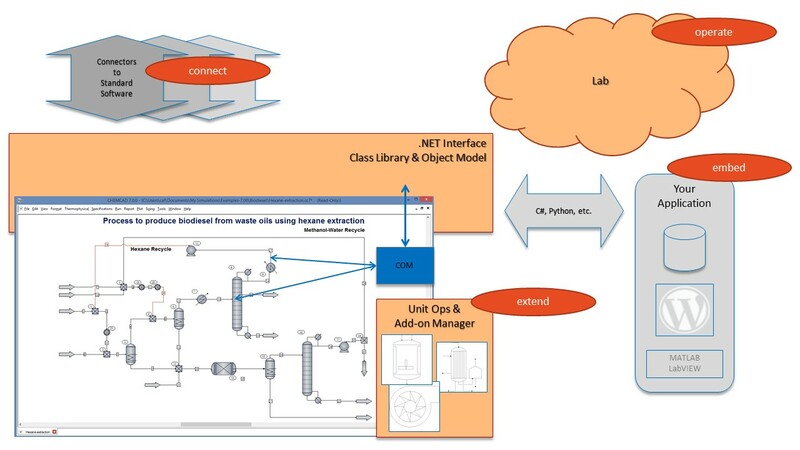 Communicate with a CHEMCAD flowsheet in any .NET programming language! Extend CHEMCAD with custom unit operations. You engineer processes with CHEMCAD. We provide special Unit Operations to enhance CHEMCAD with specific models. Or you can design your own ones! The calculation power of CHEMCAD - in a browser. Build applications for your clients, sales staff or other users without flowsheeting knowledge. Your software stack: CHEMCAD invisible in the background, your flowsheet, .NET Interface and the GUI of your choice, e.g. WordPress or a C# application. Connect CHEMCAD to any other software. We integrate CHEMCAD into your IT systems or standard software. We program interfaces to connect your IT (MS-Excel, VBA), your routines (C++, Fortran, etc.) or your devices (SCADA, OPC, CAPE-OPEN) to CHEMCAD.